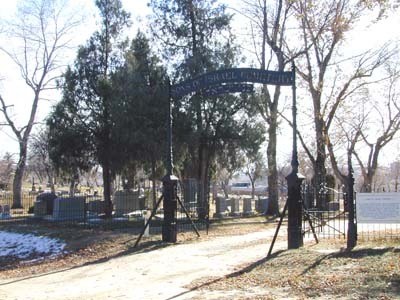 The Sons of Israel Cemetery lies adjacent to the city-owned Evergreen Cemetery at 1005 S. Hancock Ave., Colorado Springs, CO 80903. To access it, take the main entrance to Evergreen Cemetery. At the far end of the parking lot on the right is a dirt road that parallels an Evergreen Cemetery fence. Follow the road approximately one mile to the cemetery on the right. According to GPS-derived geolocation (accurate to within 10 meters), the cemetery's coordinates are latitude 38°48 50.9 N and longitude 104°47 59.7 W.